Mobile home for people with reduced mobility - 4 pers - 33 m² - 2 bedrooms - 1 shower - 1 toilet - covered terrace with access ramp for wheelchairs. Gîte 10/12 persons - La Grande Maison - 230 m² - on 3 levels: 5 bedrooms, 3 bathrooms, 2 toilets. Price up to 10 pers. Extra person, maxi 2. Chalet Premium - 6 pers - 46 m² - 3 bedrooms - 2 bathrooms with toilet - covered terrace - dishwasher. Services included: sheets, towels and bathmat supplied, beds already made on arrival, safe deposit box, baby cot and high chair (upon request when booking), wifi access included for 1 device, playtent for children, barbecue. Chalet - 5 pers - 36 m2 - 2 bedrooms - 1 shower - 1 toilet - covered terrace. Mobile home Premium - 3 bedrooms, 2 bathrooms - 6 pers - covered terrace - 40 m². 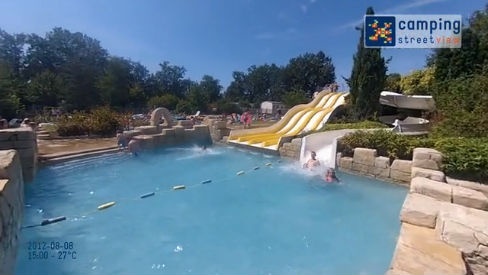 sheets, towels and bathmat supplied, beds already made on arrival, television, safe deposit box, baby cot and high chair (upon request when booking), wifi access included for 1 device, playtent for children, barbecue. Mobile home - 2 bedrooms - 1 shower - 1 toilet - 1 covered terrace - 4 pers - 29 m2 Included: blankets, pillows, set of garden furniture, microwave, coffee machine. Optional services: sheets, towels, cleaning at departure, barbecue, wifi. 6 persons maximum per pitch with a tent, caravan or camper van. Services included: water, electricity 10 A, drainage, shelter equipped with garden furniture, parasol, 2 sun-loungers, barbecue, refrigerator. wifi access included for 1 device. Chalet - 6 pers - 46 m² - 3 bedrooms - 2 bathrooms with toilet - covered terrace - dishwasher. Gîte 4 pers - Le Frêne - 1 room 2 beds 80x190cm - 1 living room 2 beds 80x190cm - 1 shower with toilet - 36 m². Treehouses for 2 people Vouvray Sancerre Montlouis Surface : 20m2 Capacity: 2 adults Up in the tree tops, you have a very special view of the forest. It offer a rudimentary but cozy comfort. There is no running water or electricity but there is a dry toilet. Breakfast is provided in a basket. Bring a sleeping bag, your own sheets and towels, and a mobile telephone with its batteries fully charged up. Vouvray: Sancerre: Montlouis: If you have a preferency for one of them, please mention it in the booking form. Mobil-home Avantage avec 3 chambres - 1 salle de bain - 6 pers - terrasse partiellement couverte de 27m²- 33m². Quartier piétonnier, draps, serviettes de toilette, BBQ, accès wifi pour 1 appareil, TV et Climatisation. Pitch Confort : 100 sqm to 150 sqm. 6 persons maximum per pitch with a tent, caravan or camper van. Free for children under 4 years. Including 2 pers and electricity 10 amp. Mobile home - 2 bedrooms - 1 shower - 1 toilet - no terrace - 4 pers - 29 m2 Included: blankets, pillows, set of garden furniture, microwave, coffee machine. Optional services: sheets, towels, cleaning at departure, barbecue, wifi. On the last week of the season the Shop was empty, the toilets weren't cleaned, there was no soap and everything started to close. The waste was too far from the Caravan. Our mobile home was not the cleanest upon arrival (mainly the toilets), we had an invasion of ants in the kitchen during the week & because it was the last week the shop was not over stocked (struggled to get bread one day, & the restaurant on Friday night had various items on the menu not available due to it being the last night). Wasps inside & outside at the bar with no sort of catching devices visible. People reserving sun loungers in the morning & then not using them till after lunch !! condition of the toilets, not acceptable for a 5 star campsite. The neighbourhood was less attractive than we expected. However, within a 30 min drive by car there are amazing castles. Beautiful camping, lovely huge places, beautifully renovated sanitair building. Nice swimming pool and lovely entertainment at night with a lot of variety. We loved staying at parc de fierbois! We were significantly overcharged in the shop but this was probably a mistake. Large private pitch. Responsive and helpful staff in reception when we wanted to change pitch due to too much shade and staying an extra night. The cafe catered for us on our first night even though they had just closed...we had travelled all day and were very grateful to the staff. The chef and the waitress were so lovely. We loved the lake The toilets can mak or break a camping holiday and yours were superb and I have never said that before! I! Thank you. Really nice site, when it was very hot there was plenty to do on site, so you didn't have to get in a car you could just walk to the pool or the lake.